Many years ago an magazine editor I was working for once told me to make sure I take pictures BEFORE I start testing. He claimed no one wants to see a beat up product afterward in the pages of print... I disagree. People should know that you actually put the equipment to the test before a review and not just pull it out of the box snap pics right for pre-arranged article content. 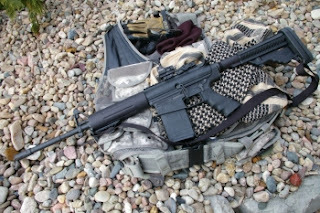 The point of all is the my review of the Burris Fast Fire II which has ridden on a Ruger 22LR 10/22 rifle and Mark III pistol and punished on a DPMS 308B and now my DPMS AP4 7.62x51 and then back to the 10/22.... Throught it all it retained zero and I should have mentioned I have never re-zero'ed it since originally sighting in on the 10/22. 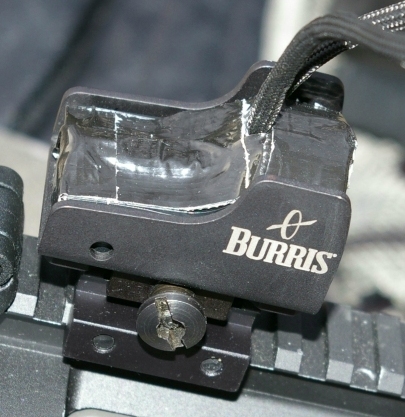 Proof is in the testing and the Burris FastFire II shot at zero after the weapons rotation and being re-mounted on the 10/22. Picatinny Protector Mount - This adds a clam of metal armor around the metal chassis of the FastFire II. I thought this would be a good idea since I was planning on it finally landing permanently on my AP4 Battle Rifle. YHM - Yankee Hill Machine 1/2" x 1" long Picatinny Riser. This provides a perfect co-witness with your back-up or fixed AR sights. Weight - With the Picatinny Mount it weights in around 1.5oz. That my friend is light compared to 14-16 oz Eotech and the like. Auto-Dimming - Think of this senario, you are transitioning in and out of the light into dark building and your sight is stuck on blaring freaking level 10. Wouldn't you rather have a sight that auto-dims? Many manufacturers are going to this feature now. In even a completely dark room the red dot is still just a little twinkle, but in full sun you get a nice bright laser dot. Auto Off - The auto dim feature works by dimming in theory to a point of "off" after the cover is installed or if for instance the gun is shoved in a safe. Parallax-free - Even if I am now perfectly aligned on my sights it will still show me where the bullet will go. Holds Zero - You have the basic sight adjustments, but you also have a lock that effectively locks the adjustment in place. Never had an issue or problem with the sight holding zero even on the big 308/7.62 calibers. Battery Life - Yes I would love one of the Trijicon reflex sights, however they are out of my price range for this endeavor. The upside is that the original set of batteries are still burning bright. Burris claims because of high tech electrics and auto-dimming that the batteries will last up to 5 years. For over two years so far they have been correct... still my first set of batteries. I sometimes do wish the On/Off switch would be a little bigger, usually when I am turning the unit on or off, however if it was bigger it might get hit and accidentally turned off or one, so I am personally on the fence on whether this is a big issue. I do wish Burris had some sort of speed cover that I could flip off and it would automatically turn the unit on. It would be nice if it was something like a Butler Creek scope cover that flipped over to the left side and out of the way, but could be removed if required. 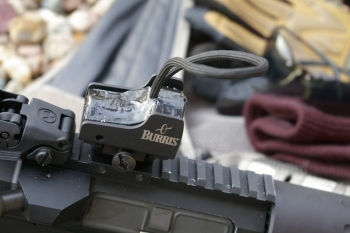 Burris has indicated that the smart electrics allow the unit to be left on and when the cover is on the sight that the sight basically turns off until the cover is removed, however since they don't recommend that for long-term storage this would not be my choice of regular operations. My option to make a quick remove cap was to tape on some paracord... works pretty well. 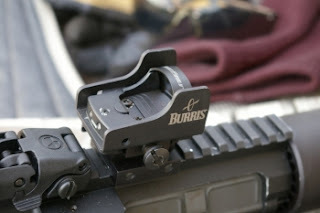 Overall I have been very (with emphasis) happy with the Burris Fast Fire II and am planning on laying down some cash on a second one for my Ruger Mark III Target Pistol and possibly a third for one of my upcoming AR builds which is as good a recommendation as I can give any product. The FastFire dramatically increases speed and accuracy. 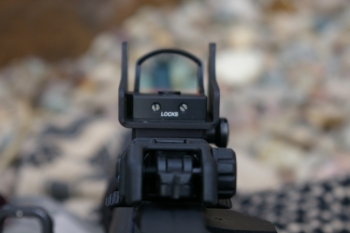 It simplifies the act of aiming, eliminating the need to focus on and align the front sight, rear sight and target. With the FastFire, the aiming red dot and target are always in focus and properly aligned for the ultimate in accuracy. The FastFire II provides the only fully waterproof unit in its product category. The FastFire sight is very small, mounts very low, and weighs a mere 1.6 ounces. And it has repeatedly proven it’s toughness on the slides of high power semi-autos, on slug guns, on shotguns and on high power rifles. FastFire is powered by a lithium CR2032 battery, which is commonly available and long lasting because of the highly efficient electronics and the battery-saver mode. A battery can last as long as five years. The Picatinny Mount allows mounting on just about any rifle. Special bases are available for the most common firearms.